How much water is used for irrigation? SM2RAIN is a simple algorithm for estimating rainfall from soil moisture data. If you do not believe it is possible, try yourself! The SM2RAIN code and the soil moisture derived rainfall data sets are freely available and can be downloaded here. The description of SM2RAIN and of its performance can be found in Brocca et al. (2013) and Brocca et al., 2014. (also here at IRPI-CNR website). “Rainfall estimation from soil moisture observations, SM2RAIN: recent advances and future directions“, EGU General Assembly 2018, Vienna, Austria, 11 Apr 2018 (solicited). The latest SM2RAIN-ASCAT rainfall dataset is now available. Time coverage: 2007-2017. Spatial\temporal resolution: 12.5 km\1-day. If you want the data, just send us an email! More info on the Twit below. 🛰️We have updated the NEW #SM2RAIN-ASCAT GLOBAL #rainfall 🌧️dataset (12.5 km/daily, 2007-2017) by considering better the add of Metop-B in 2013. Flood simulation over 975 basins in Europe with the new SM2RAIN-ASCAT dataset…results are really good! Here you can find two recent TALKS (IPWG 2016 – SMAP 2016) showing the latest results with the applications of SM2RAIN to multiple satellite soil moisture products (ASCAT, QUIKSCAT, RAPIDSCAT, AMSR-E, AMSR2, SMOS, and SMAP). In the paper by Massari et al. (2014) it is shown that SM2RAIN-derived rainfall from in-situ soil moisture observations even improves flood modelling (see also here, Italian media). In this paper by Brocca et al. (2015) the application of SM2RAIN to synthetic and in situ observations at several sites in Europe further underlines the robustness of the method. In Ciabatta et al. (2015) the integration of SM2RAIN with state-of-the-art products has provided significant improvements for rainfall estimation over the whole Italian territory. The latest application of SM2RAIN is for irrigation assessment, see here the project and a first overview paper. Other scientists are using SM2RAIN in Mexico, in the Tibet Pleateau, and on a global scale. 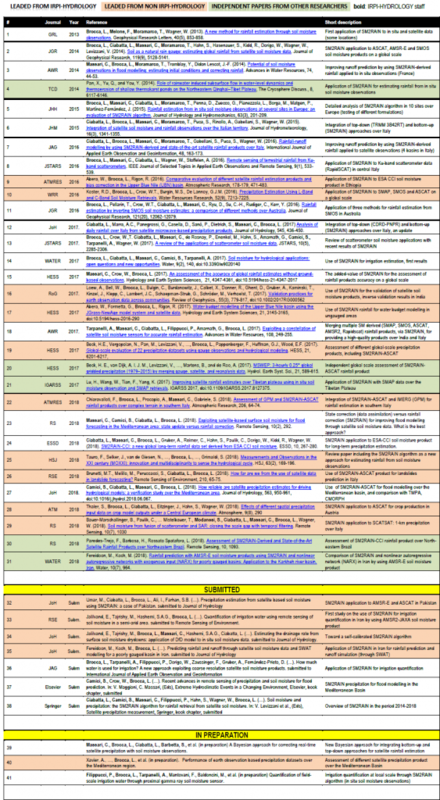 Click on the image below for the current (August 2018) list (PDF) of 41 SM2RAIN-related papers with link to full text (31 accepted, 7 submitted, 3 in preparation!). Below an example of the correlation maps obtained with the new SM2RAIN-ASCAT dataset (bottom left) with respect to the first version published on JGR (Brocca et al., 2014, top left). The benchmark is the GPCC Full Data Daily Product and the correlations are computed for 5-day accumulated rainfall. The improvements with the latest version of the rainfall product are significant worldwide (see also here). On the right, the integration of top down (GPM late run) and bottom up (SM2RAIN-ASCAT) rainfall products is shown for estimating daily rainfall in central Italy. The integration provides a correlation of 0.874 for the GPM+SM2RAIN-ASCAT products (see also here)! Finally, we applied SM2RAIN to Sentinel-1 soil moisture data in Italy. Below the maps of mean annual rate. On Twitter you can find animations (click on the image).